Join us as we reflect on the significance of this day of waiting and hope for us today. Let us join the people at the tomb. Let us pray with and for those waiting for justice, peace and equity. 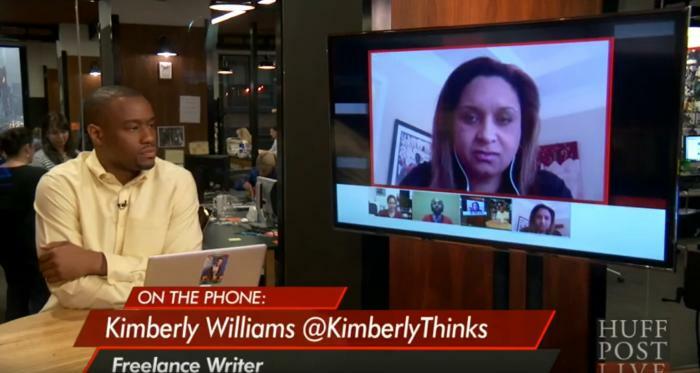 Reflect on how you are called to be an ambassador of radical hope here and now! 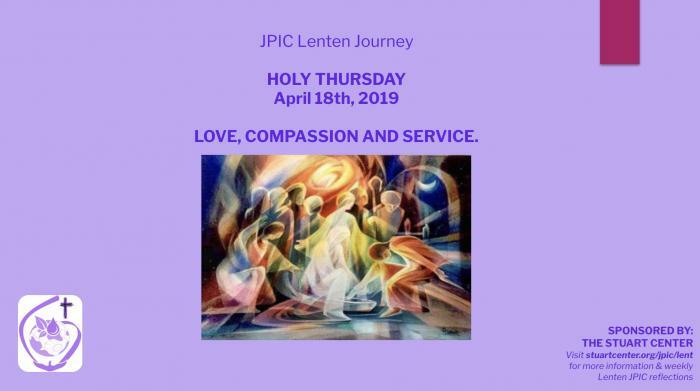 Holy Thursday gives us countless opportunities for prayer, service, friendship, and community. It is in the ordinary small acts where we have a profound, long-lasting effect. It is an opportunity to listen and contemplate the infinite and unconditional LOVE of Jesus. 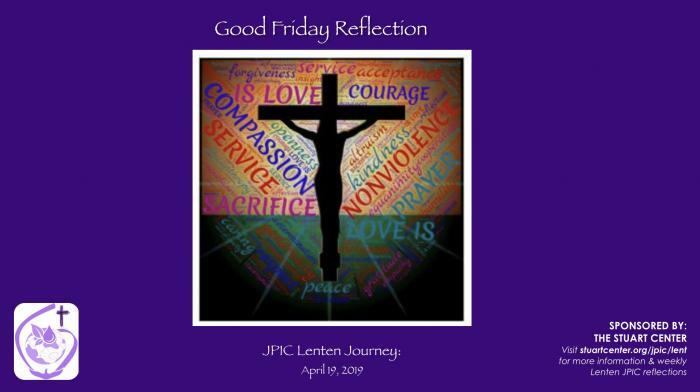 Our Good Friday reflections remind us of our Lord's suffering at the hands of an unjust system and of one who washed his hands of responsibility. 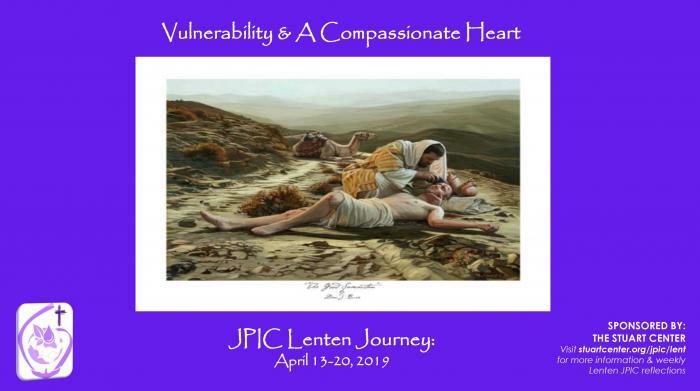 As we enter into Jesus' experience we invite you to recognize the experiences of complicity and suffering in your own life and in our world. 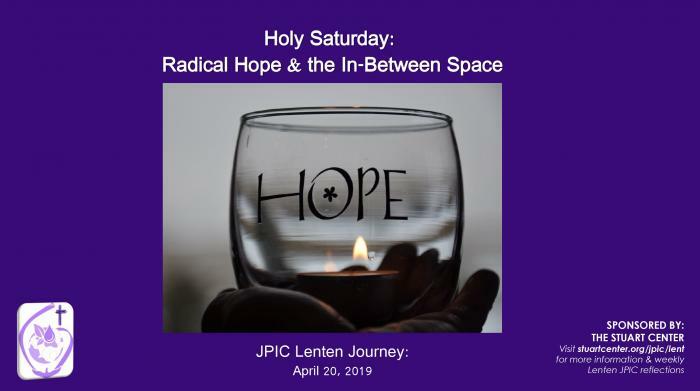 This week we enter into Holy Week and approach the end of our JPIC Lenten Journey. As you recall we began the season with a self-paced retreat and now we close with one. 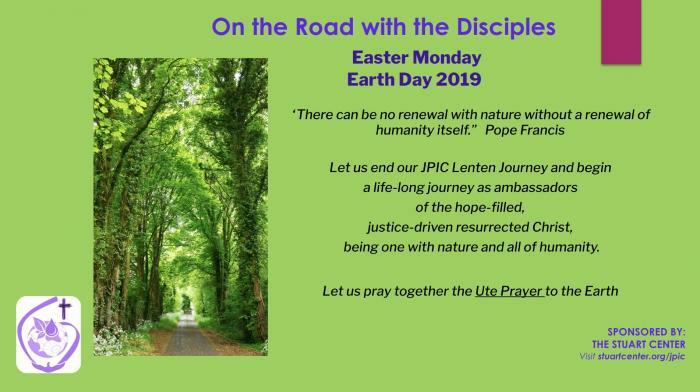 We invite you to take longer periods of reflection and meditation this weekend to prepare ourselves to live Holy Week and walk with Jesus. The best way to be close to His heart is to recognize our own vulnerability and compassionate heart. This week is also called passion week and so let us move through this week with the passion and compassion of our Lord. Thank you for being part of the journey. As we have heard and know (in our heads), power in itself is neither good nor bad; it is a matter of how we use it. The reality, however, is that this can sound a bit cliché and a lot different than what we experience, observe, exercise in our everyday lives. 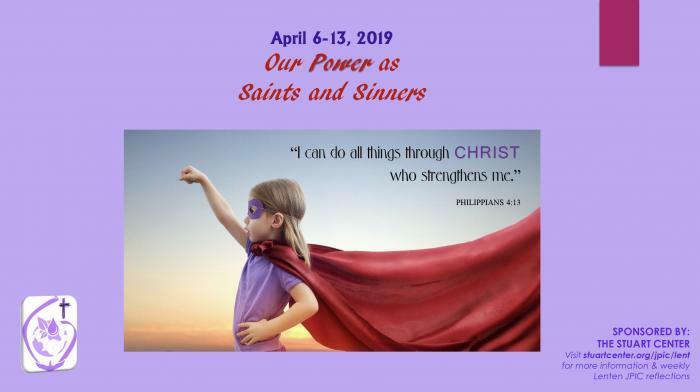 Lent is the PERFECT TIME to reflect deeply on the power we do have – yes, we ALL have power – and how we use it as saints and sinners. This week we invite you to reflect on various aspects of power in relation to social justice and social change. 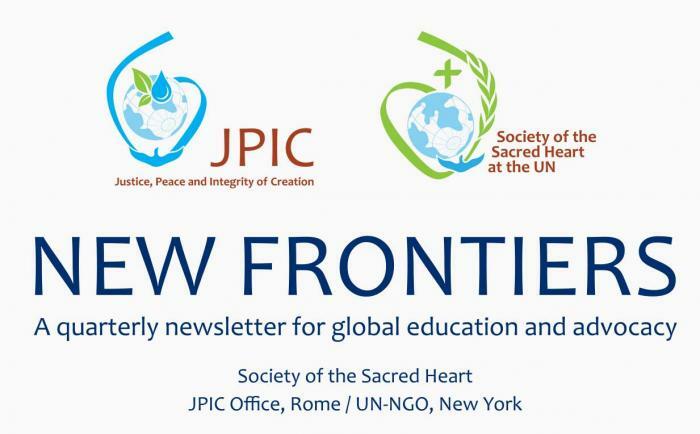 Attached is the Newsletter, New Frontiers – A quarterly newsletter for global education and advocacy – from the JPIC Office, Rome/ UN-NGO Office, New York. 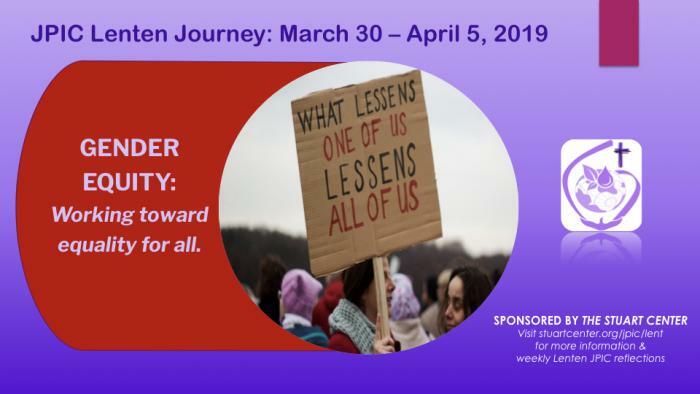 Welcome to the fourth full week of Lent on our JPIC Lenten Journey. Today we share the materials for the week of reflections on “Gender Equity: Working Towards Equality for All.” Gender equity and equality are foundational elements for all the emerging themes from the Society of the Sacred Heart’s International JPIC meeting in November 2018 in the Philippines as well the ongoing themes in the Society’s Chapter documents and for the Network of Sacred Heart Schools. 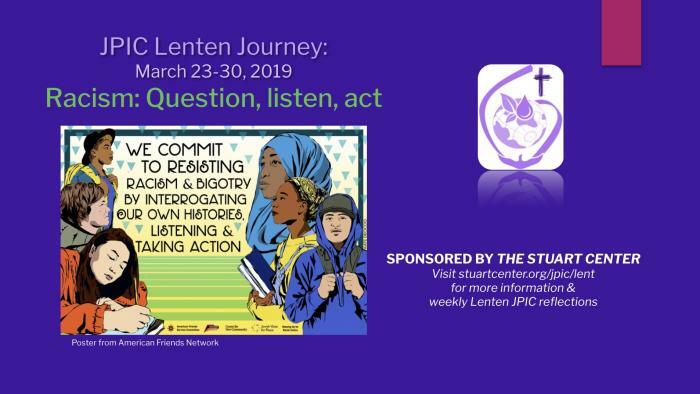 Welcome to the third full week of Lent on our JPIC Lenten Journey. Today we share the materials for reflection on “Racism: Question, Listen, Act." While racism was not a "named" theme from the Society of the Sacred Heart’s International JPIC meeting in November 2018 in the Philippines, the reality of racism around the world is implicit in all of the emerging themes as well as the Society of the Sacred Heart's current examination of its historical involvement in slavery in the United States. 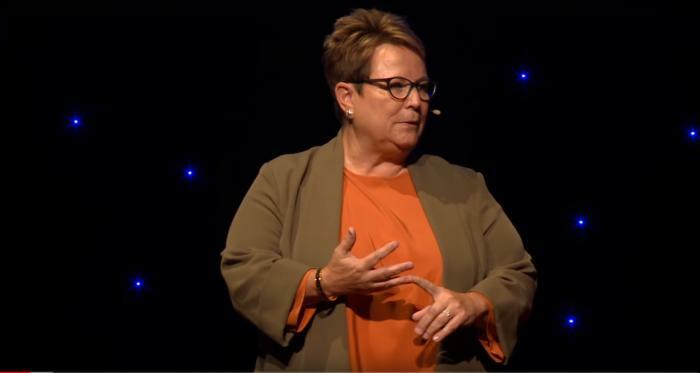 University Chancellor, Susan E. Borrego, reflects on her life as an emancipated minor and dissects the emotionally charged conversation surrounding race relations in the United States. This raconteur uses her powerful first-person account of "White Privilege" and "Black Lives Matter" to underscore the responsibility each one of us has to bring about change. 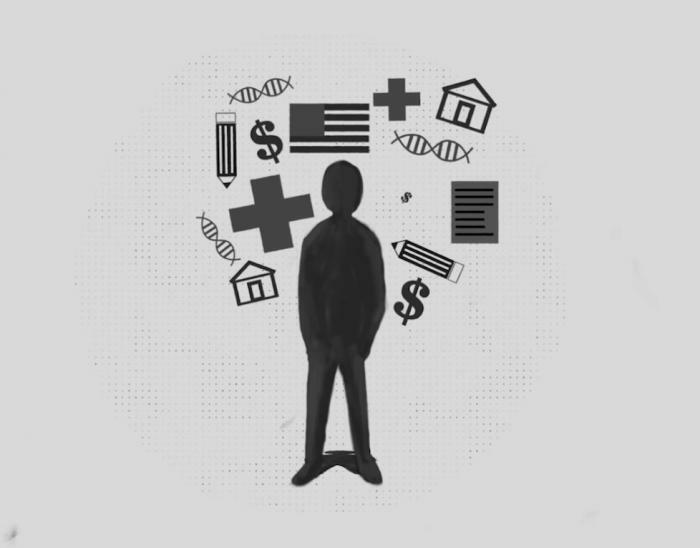 In this Wireless Philosophy video, Eduardo Mendieta (Penn State University) asks "What are the consequences of race thinking and the institutional and legal forms of segregation if race is not real? Why do we categorize race as a real thing based on visual perception and how is such a category anti-democratic?"